M77 and NGC 1055 form an interesting pair of galaxies in Cetus and are the dominant galaxies in the M77 group of galaxies. 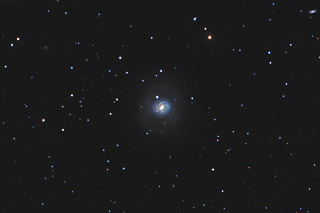 This image is a composite image made from a wider frame with both galaxies, and then separate cropped images of M77 and NGC 1055. By making this image as a composite, I was able to have a wide field with sharp focus across the entire frame. In this image, North is to the right. This image is cropped to 92% of the original full frame. Software Used Images Plus 4.5 for camera control, calibration, stacking, digital development, multiresolution sharpening, smoothing and noise reduction. Photoshop CS5 used for levels and curves, color correction, selective color, high pass filter, star shrinking, lab color, saturation adjustments, screen mask invert, lens correction, and smart sharpen. Gradient Xterminator for gradient removal. Carboni Tools for additional saturation adjustments, noise reduction, and smoothing. HLVG for additional color correction. Registar for image alignment. Notes I put a lot of hours into this image and I think the effort paid off. 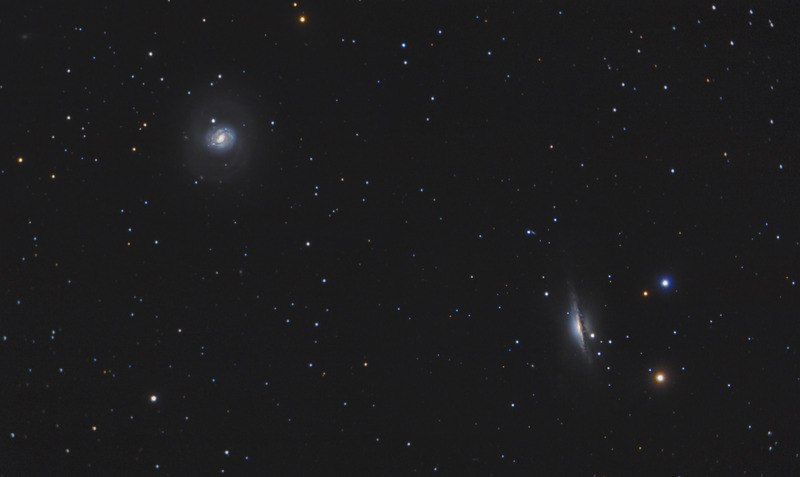 Both of these galaxies are relatively faint, but I was able to capture some fairly nice detail as well as a good collection of background galaxies, too. 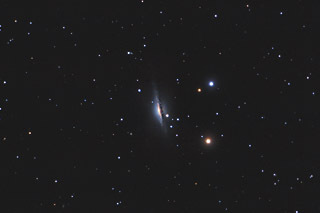 This imaged was published in the chapter on Seyfert galaxies in the textbook, Alien Skies, A Travelogue of the Universe by Dr. Mario Mateo.